Over the past nine months, circles of Black farmers, educators, healers, cultural workers, and organizers have been aligning their analysis and visions through the Black Land & Liberation Initiative. We believe all peoples have the right to the resources required to create their own productive, dignified and sustainable livelihoods through their own labor and self-governance. The wealth created from the theft of Black peoples and Indigenous land form the foundation of the U.S. economy. In June, we are launching a National Call to Reclaim land as Black folks to steward and govern as centers of joy, healing, and sanctuary. This is a step in co-creating strategies for transformation grounded in a long-term vision, guided by the resilience and creativity of our ancestry, and rooted in our sovereignty. We must transfer wealth from where it has been concentrated and used as a weapon against Black bodies, Indigenous lands, and the very planet we all depend upon. We must assert our right to the self-determination of our peoples alongside Indigenous sovereignty. 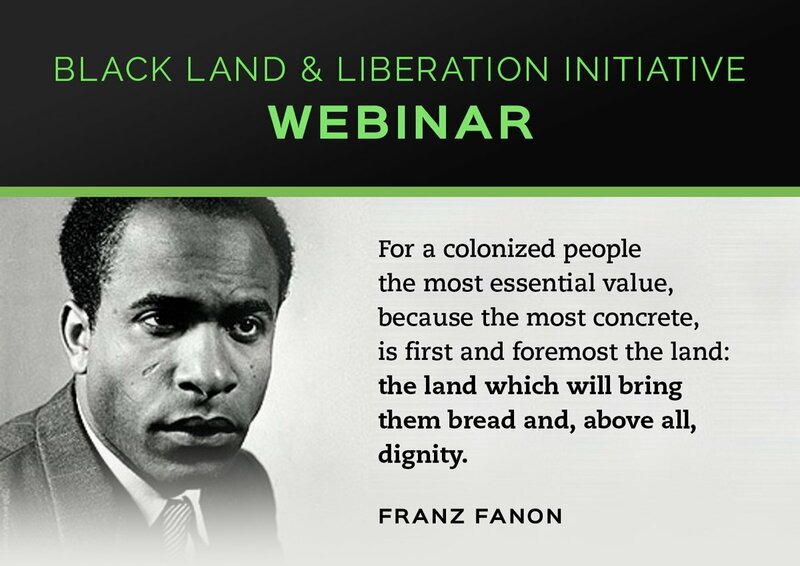 Please join us for a webinar on Monday, May 15th to learn more about how you can support strategies for transformation and Black liberation.